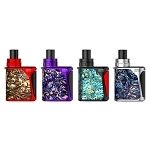 The Smok Novo Kit is a powerful refillable pod system from one of the top names in the business that sports a high end and luxurious cobra panel design for a unique appearance to match it's top performance. Almost 3.5 inches long and just under an inch wide, the Novo Pod System is one of the smallest you can buy. It is comfortably hidden in the palm of your hand and easily slides into a pocket to accompany anywhere you go without it weighing you down. Inside every Novo Starter Kit you have two high quality refillable pods that can hold up to 2mL of your favorite salt liquids at a time. Each Pod has a powerful and long-lasting horizontal atomizer integrated inside with a premium organic cotton wick for robust flavor. 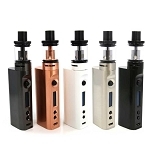 They also have an ergonomic curved mouthpiece design that contours to your mouth perfectly and an air-drive side airflow system that helps to create impressive amounts of vapor. 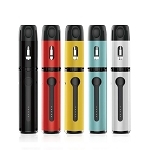 Each Pod is has a side refill port system that makes refilling quick and simple. When you have yours ready to go, they use a proprietary magnetic connection system that allows it to install quickly and securely with absolutely no effort on your end. It is powered by a premium 450mAh lithium-ion battery with automatic draw activated firing system. All you have to do is connect your filled Novo Pod, inhale and it does the rest for you. There are no buttons to fool around with, making it that much more easier to use. 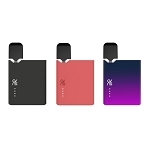 It uses a direct voltage based output system that depletes along with it's battery life, accompanied by a LED power light indicator that will keep you in the loop the entire time. This premium battery will easily last all day long on a full charge. When it eventually drops below a 3.3V output the power indicator will flash red 15 times to let you know it is time to recharge. Connect to the included compact USB cable and you will have a full charge in just a couple of hours.